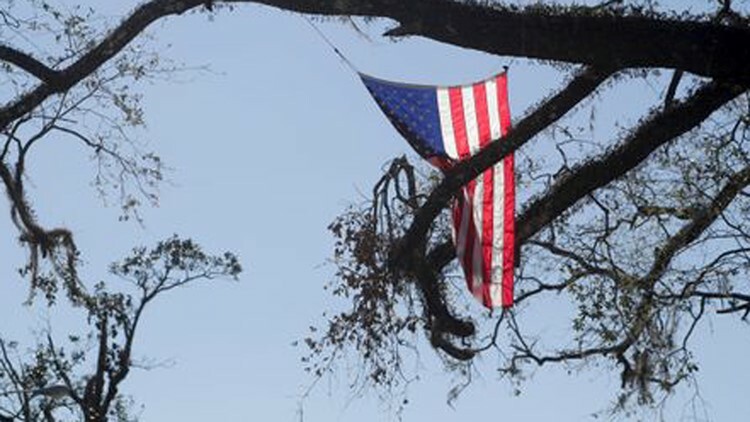 American flags line North Second Street of Wewahitchka, Florida on Tuesday, Oct. 30, 2018, three weeks after Hurricane Michael devastated Gulf County. Hurricane Michael damaged polling stations and displaced thousands of voters. PORT ST. JOE, Fla. — Three weeks after Hurricane Michael leveled more than a thousand homes in this tight-knit beach community, empty businesses and homes line the streets. There's more here to be concerned about than an election. While American flags adorn the roads that lead voters to the polls, the massive storm damaged polling stations and displaced thousands of voters. Michael has taken its toll on this GOP stronghold, which includes Bay, Calhoun, Franklin, Jackson, Gulf, Liberty, Washington and Gadsden counties. All but Gadsden, which leans Democratic, help make up the deep red swath of Republican support throughout Florida's Panhandle. The counties are lagging in early voting turnout and absentee ballots returned compared to the rest of the state, with two — Liberty and Jackson — serving as the only counties in the state that saw a decrease in ballots cast early with five days left before Election Day compared to the same period during the 2014 midterm election. Data shows these eight counties combined during the last midterm in 2014 had a voter turnout percentage that matched the statewide turnout with five days before the election. This year, they are falling behind the statewide turnout rate by six points, mostly because of a drop in absentee ballots returned. Under-performance in the Panhandle would be a concern for statewide Republican candidates, said Mac Stipanovich, a GOP political consultant. "The Panhandle is a reliable Republican stronghold. What it lacks in sheer number of voters it partially makes up for with lopsided Republican margins," he said. In Florida, where statewide races are usually won by razor-thin margins, small numbers could have an impact on tight races like the U.S. Senate race between Democratic U.S. Sen. Bill Nelson and GOP Gov. Rick Scott, and the race for Florida governor between Democrat Andrew Gillum and Republican Ron DeSantis. In 2014, Scott narrowly won re-election against Democrat Charlie Crist by 64,145 votes. The rest of the state's voters are casting ballots earlier than ever before in a midterm election with about a 70 percent increase overall, the data obtained by the USA TODAY Network-Florida shows. So it's possible that areas with greater populations of Republican voters could help counter any drop in the hurricane-ravaged counties. “I think there is a good chance that turnout ends up being a little bit down from the 2014 midterm election, but I don't think it will have that big of an impact on races," Democratic strategist Steve Schale said. The eight counties most impacted by the storm fall among the bottom 15 of the state's 67 counties, according to data for early and absentee ballots cast five days before Election Day for both years. While early in-person voting numbers have increased in the counties at a rate less than much of the state, the biggest impact appears to be in a dip in the number of absentee ballots returned. The counties impacted by Michael so far have seen a 29 percent decrease in absentee ballots returned, compared to a statewide increase of 36 percent for returned absentee ballots. A big problem for these areas has been people losing their ballots when the hurricane walloped people’s homes, or displaced voters struggling to order new ones by mail, said John Hanlon, Gulf County's elections supervisor. In the coming days, as the election nears, it is possible to see those absentee ballots start to come in. While low compared to the rest of the state, Gulf still has seen a 30 percent increase in early and absentee voting and Republicans cast nearly two-thirds of the ballots. Hanlon said he remains hopeful because Scott’s decision to ease voting rules in his county has helped. "This may be the biggest turnout we have seen in a midterm election in a while if these numbers keep up," Hanlon said. "I should have known that our voters are resilient." To ensure the election is carried out as smoothly as possible in the impacted areas, Scott issued an executive order that relaxed voting rules in the counties. These changes included extending the early voting period through Election Day. Florida law requires early voting to conclude the weekend before Tuesday. Bay County, the area including storm-ravaged Panama City with the largest population, has seen about a 20 percent increase in early and absentee voting, with Republicans casting 64 percent of the early ballots and Democrats 24 percent. Franklin County, more rural and less populated, has seen a 28 percent increase in early and absentee voting, and Gadsden, dominated by Democrats, has seen an 18 percent increase, data show. Washington and Calhoun counties both saw single digit growth. Michael already has affected Election Day in the area, where voters are expected to see a smaller amount of polling stations in their counties because some buildings that used to serve as voting precincts are too damaged to accept ballots. In Gulf County, for example, the biggest polling station has been transformed into a long-term shelter for those rendered homeless by the storm, Hanlon said. The county set up two voting "super stations" where any registered voter can cast a ballot. Despite the circumstances, some die-hard GOP voters that have helped define this storm-ravaged community have already cast their votes. Two days before he scoured a sea of donated goods to replace shoes and clothes he lost in the storm that wrecked his home, the 58-year-old headed to a polling station in Gulf County, where he lives, to cast his vote. Like Simon, 68-year-old Simon John Burttschell was also determined to vote. He headed to Wewahitchka Branch Library, partially open for the purpose of early voting, to vote Republican up and down the ballot before heading to Panama City to buy construction material to fix his caved-in roof. "There's no way I am waiting until Nov. 6 to vote," Burttschell said. These two men joined 45,890 others who cast ballots early in the eight Panhandle counties hardest hit. But this is not an ordinary election year. Through Election Day, local supervisors will be coordination with the state to ensure they have the equipment they need to ensure their polling stations will have working communication and electricity to operate. Hanlon says telephones and internet are crucial in operating polling stations to ensure double votes are not cast and voter fraud is caught. In Gulf County, Hanlon has been working to connect with displaced voters over the phone, to make sure they have a replacement absentee ballots they may have lost in the storm. He said Michael came ashore on the day ballots were expected to arrive in the mail for most county residents. After the hurricane hit, Scott also waived a voting rule for Panhandle counties that would have restricted local officials from mailing ballots to different addresses other than the ones the county has in file for voters. “If you are a displaced voter, give us the address you will be at and we can and will mail you a vote by mail ballot to that address,” an announcement posted in the Gulf County Supervisor of Elections website reads. With numerous voting rules relaxed, there have been concerns raised about Scott's reaction to this Republican heavy region compared to other voting decisions made in the past that affected Democratic counties. In 2012, a year after Scott signed a law that eliminated early voting the Sunday before Election Day, voters in Broward and Palm Beach counties, two Democratic strongholds, waited for hours to cast their ballots prior to Election Day. Lawmakers eliminated early voting the Sunday before Election Day after Democrats turned up in droves that day in 2008. After Michael, Scott cited the "strict application of some provisions of the Florida Election Code" as reasons for his decision to waive voting rules. Scott's order states those provisions "may preclude local supervisors or elections from providing voters in the affected counties with the same opportunities to cast ballots as voters outside the affected counties."